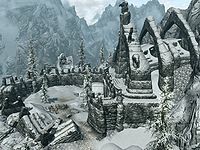 Forelhost is a ruined fortress on a peak southeast of Riften which contains a word wall for the Storm Call shout. The ruins have an exterior courtyard and contain three interior zones: Forelhost Stronghold, Forelhost Crypt, and Forelhost Refectory. The courtyard of Forelhost contains a small campsite with a single tent. This is where Captain Valmir can be found, claiming to be an Imperial or Stormcloak officer, depending on your allegiance and progress in the civil war questline. He asks for your help, and can give you information on the history of the Dragon Cult, initiating the quest Siege on the Dragon Cult. The courtyard is surrounded by the remains of the walls and battlements, with a door leading into the stronghold. The word wall is reachable by scaling the mountainside through a combination of jumping and/or using the Whirlwind Sprint shout, bypassing the dungeon entirely. The mountain slope northeast of the ruins, or the arch above the door to the ruins, can be climbed this way. The first zone of the fortress is partially in ruins. The direct route to the second zone is blocked by a portcullis, and you'll have to take a long, trapped path around behind it to reach the next zone. This zone is populated with the ghosts of the dragon cultists, which are inivisible until you are quite close, though they can be detected with Detect Dead. Some of these are melee warriors, while others are mages. Later in the zone, you will also meet draugr. One room contains a forge, a workbench, and a grindstone, as well as some iron ore and ingots. Skorm Snow-Strider's journal can be found here, providing additional background information on the fortress and the last days of the siege of the Dragon Cult's last stronghold. The second zone consists of old burial crypts. Immediately after entering this zone the path curves to the right. There are two dead Draugr and a stealth Dragon Cultist in this corridor. There is a table at the end of the corridor with a soul gem, and from here there are two exits. To reach the third zone, you must pass down through the well at the northwest (left) exit. However, the well is enclosed in a cage secured by a master-level lock. You can either pick the lock or search through the other path (northeast - right exit) to the back of the crypts, which contains the key to the well. The corridor to the well room has two swinging axes traps, and in the well room there are some burial urns and minor loot. Following the northeast passage, you come to a descending corridor with a dead Draugr, a White Cap, a Namira's Rot and a Imp Stool. At the end of the ramp there is an opened wooden door to a room that contains a sort of altar, a stealth Dragon Cultist, and a table with two dead Draugr. There is a healing potion on a sconce on the wall, to the left of the dead Draugr, and some burial vases throughout the room. From this room there are two wooden doors on the Northeast wall and an iron door on the Southeast wall. The door on the left of the altar has minor loot, and the one on the right is barred from the other side. Taking the iron door, you come to a corridor ending in a T junction, with a burial urn in front of you. The short, left corridor contains an awake Draugr and a burial urn. The right corridor descends into a room containing a leveled Draugr. In front of you as you enter the room, there is an open wooden door to a room containing another Draugr, who will be alerted by the fight. The second Draugr's room contain a burial urn. On the left side of the door where you first entered the leveled Draugr room, on the eastern wall, there is a discreet wooden door to a corridor with an unlocked chest and a pressure plate that activates a spike wall. On the northeast wall of the leveled Draugr room there is an iron door leading to a corridor with webbed walls. There is a slumbering Draugr on a sconce directly in front of you, before the corridor turns to the right. There is a leveled Draugr farther ahead that will be alerted by the fight. Near this second Draugr there is a healing potion on a trapped plinth; removing it will activate a poison dart trap that will not stop, making it difficult to follow the corridor that bends again to the right. At the end of the corridor will be a room with a pillar with a lightning rune, three dead Draugr, a dead bandit, and two leveled Draugrs. There is another lightning rune on the floor, near the stairs that go out of this room, on the northeastern end. Because of all this, the leveled Draugrs can be tough to battle. Descending the stairs you come to a corridor with a lying slumbering Draugr right in front of you. The corridor curves to the right, to a well-lit area with a Master locked chest, before curving to the left, where three slumbering leveled Draugrs are lying. Down the corridor there are three more slumbering Draugrs, and before the corridor curves to the left there is a pressure plate on the floor that activares a spike wall. After the curve there is another pressure plate for the same trap, and in front of you there will be another slumbering Draugr. After a curve to the right and another to the left there will be three more slumbering Draugr, two of them leveled. Two pressure plates on the floor activate two poison dart traps; the second of them is right before an iron door. After this iron door there will be a bigger room where three leveled Draugr will emerge from sarcophagi. Between the middle and right sarcophagi, on a well-lit raised area, there is an unlocked chest that contains the key to the well cage, as well as some other loot. Looking to the left at the top of the wooden stairs opposite the middle sarcophagus on the central southeastern pillar you can see an unlocked chest that can be reached using Whirlwind Sprint. Continuing up the wooden ramp, you come to a frost trap that can be deactivated by removing the powering soul gem from the respective plinth. Continuing along the path you come to the barred door that leads to the altar room. Once you gain access to the well, you can swim through it and reach a cave area with some skeevers and the corpse of a frostbite spider. This area contains a quicksilver ore vein between two large webs at the top of the ramp, with a gold ore vein to its left. The next section contains a dead Draugr next to a table that contains some poison, as well as an ancient note. A copy of the Restoration skill book The Exodus can be found in the bookcase to your right. The next room contains three leveled Draugr and a trap floor, with a raising circular section. There is a ramp to the left. At the top of this ramp to the right, next to two piles of dead Draugr, is the door to the next section. You will soon find a room with a locked portcullis, a raised balcony to your right (with some draugr archers), and a passage to your left. On the table you will find Forelhost note 1 and 2. The latter will lead to a way around the room and back to the raised balcony. Be careful of traps (including weight sensitive plates and spellcaster traps) and draugr. On the balcony level, further progress is blocked by a spear-gate with no obvious means of opening. Taking the glass claw from its pedestal opens this gate. This claw will provide a hint on how to open the puzzle door you will find ahead. This door provides access to the last room in the zone, and can be opened with the sequence (from outer to inner ring): Fox—Owl—Snake. Inside the last room you will meet Rahgot, dragon priest of Alduin, and bearer of the eponymous mask. As you approach his resting tomb, he will rise, along with four leveled draugr, to attack you. This can prove to be a very challenging battle at higher levels, as you will likely be facing several draugr deathlords, along with Rahgot. It is possible to split the group, making it easier to defeat. You only need to go as far as the top of the steps for Rahgot and the draugr to rise. Once they do, quickly returning back down the steps and to the other end of the previous room can draw the first two draugr away. It is also possible to draw the other two out of the main room in the same way, making all four easier to dispatch. Rahgot's main offense is fire, in the form of fire-based Destruction spells, the high-damage fire walls produced by his staff, and the flame atronach he can summon. Rahgot carries his mask as well as a key to Forelhost Battlements. There is a ceiling spike trap in the floor heading toward the main chamber. This could be used against the draugr when fighting, but also against you if you step into the center of the floor. The door behind Rahgot's tomb opens onto the balcony above the entry door in the courtyard. Make your way around to the right to find the word wall bearing one of the words of the Storm Call shout. From here you can jump down to the courtyard, where the tent is. The Lost Paladin can be encountered in front of the word wall if Chrysamere is installed. The glass claw gate may not retract when the claw is taken. To fix this, place an object on the pedestal where the claw was resting, then take that item to release the door. The glass claw may get knocked off its pedestal and onto the ground if spells of blast effect were cast nearby. The ghosts are considered NPCs, and thus cannot be soul-trapped in regular soul gems. Black soul gems are required. One of the traps encountered within the fortress is triggered by a weight sensitive plate on a pedestal (currently held in place by a potion). When the potion is removed, a volley of darts will be fired, and continue firing until another weight of some sort is placed on the trigger. The above mentioned trap sometimes cannot be reset via placing another object upon the pedestal. You can reload the game from the previous autosave (the door just entered) and it may reset the trap. Then, being careful to NOT trigger the trap again, stay to the right-hand side of the wall. If you haven't chosen between Imperial and Stormcloak yet, Captain Valmir can be either, with both types inside. The first few cultists carry an inordinate amount of arrows, up to 126 each. The cultists wear ancient Nord armor, the only location where all pieces of this type of armor may be looted at once. The Dragon Cultists can be detected with the Detect Dead spell before they go hostile. Many of the battles revolve around large amounts of Draugr gathered around a trap of some kind, making many battles hazardous. Ranged weapons are suggested. Forelhost also appears in ESO and Legends. If the puzzle door does not work, check here for possible fixes. The mask and key may not be on Rahgot's body, rendering the quest uncompletable. Many of the traps with pressure plates in Forelhost Crypt are triggered even if the player has the Light Foot perk. The contents of the boss chest do not respawn alongside the rest of the dungeon. ? This page was last modified on 24 April 2019, at 04:25.